As you are no doubt aware (due to incessant media inundation :)) we are but days from the Holiday Shopping Frenzy known as Black Friday, to be closely followed by Cyber Monday, and then a couple weeks of generally frantic gift buying. Of course, if you happen to have a lot of people to shop for who are writers, then this list will come in handy. BUT, if you, like many of us, are surrounded by friends and loved-ones who long to get you the perfect present but have no idea what that is, it will come in even handier because you can send them over here to this list and end up with something you actually want! So here you go. 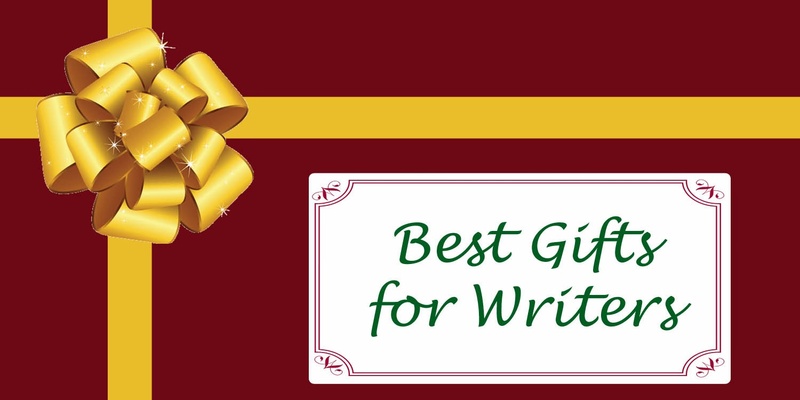 Awesome gifts for writers. 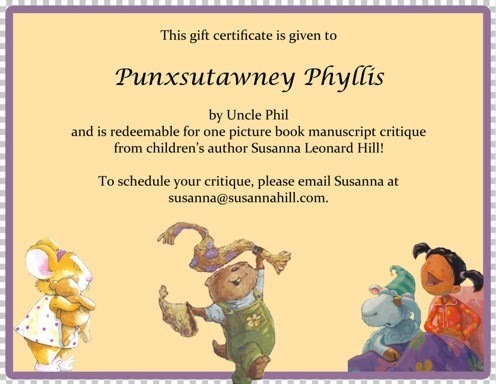 And since this blog is primarily focused on picture books, the gifts are often most appropriate for picture book/children’s writers, but many of them are valuable to all writers. Oh, and by the way, everything on this list is either something I’ve read/used/taken/done myself or that has been recommended from a trusted source, so the quality should be good! 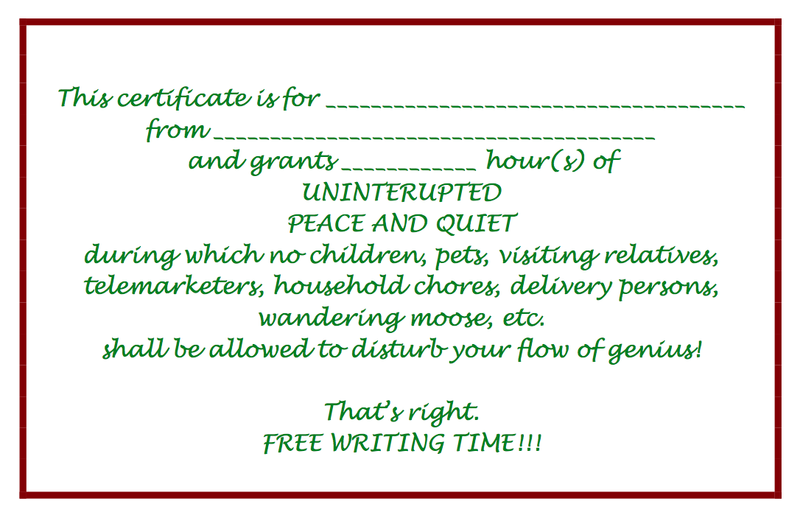 Every writer appreciates uninterrupted time to write, so give this certificate, rolled in a scroll and tied with a bow to the writer on your list. Take the kids to the zoo, or the dogs for a walk, or yourself to the movies, and leave your writer with a couple of blissful hours of peace and quiet to pour those words onto the page! Writing Materials: Writers love paper! They can never have enough post-its, memo pads, notepads, or notebooks. No doubt one or more of these will be right at home on your writer’s desk… or in their car… or wherever they need to write! Notebooks/Journals/Notepads: Writers need notebooks for everything! Idea notebooks, reading logs, dream diaries, quote books, scrap books, log books, character sketches, and free writing… explore the options! Middle-of-the-night idea? No problem with this lighted notepad and pen that writes at any angle! Picture Books, Literary Fiction, Suspense Novels, Romance, Biographies etc. – writers love to read! A local indie bookstore/Amazon/B&N Gift Card for the amount of your choice will always be welcome! Support your favorite authors by gifting their books! * 12×12 information is not yet listed on Julie Hedlund’s website so for your convenience, details are listed at the bottom of this page. Please scroll down. Conferences/Retreats: Writers like to go places and hang out with (and learn from) other writers! 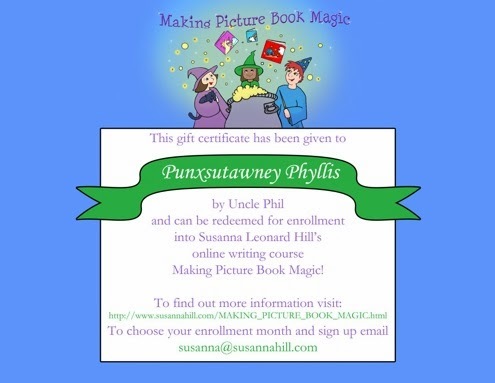 Promotional Materials: Writers need to publicize their books! Fuel: Writers need chocolate to keep up their energy! T-Shirts: Let the world know you’re a writer! Clocks: all writers need more time! If anyone has items they feel should be added to this list, please email me at susanna[at]susannahill[dot]com and I will be happy to check them out and add if appropriate!!! Don’t forget, the information about Julie Hedlund’s 12×12 group is below. I hope you (and all the people who want to buy you presents) will find this list useful! In the great big Internet, there is a writing group, where folks commune, and write picture books like — A Dog Jamming on the Bassoon…If what you need is the motivation to get your drafts written, along with the accountability of a deadline and the company of a communityof writers dedicated to improving their craft, this level is for you! Perhaps you already have a stockpile of manuscripts drafted, and you would like to challenge yourself to revise some of them while also writing new ones. The Shel SILVERstein level gives you the ability to get feedback on YOUR work — queries, pitches and manuscripts — perfect for writers want to focus on both writing and revising. Shel SILVERstein is also perfect for agented, published authors who would like access to an instant platform. A place to share your books, events, trailers AND to get promotion assistance (in the Help an Author Out section of the Forum) from fellow members. Oh, please do. I have a couple people in mind and would love to know your impression of them. What a well thought out list. Wow! But you left out one thing. How about an iPad Air? Would it kill somebody to get me an iPad Air, for crying out loud??!! Ugh. I need new friends. Oh my, Susanna, what a fabulous list. I can just imagine the time it took to put it together. I'll be saving this list. Thanks again! WOOOOOO!!! (and actually I am in my PJs – today was PJ Day at school) I have a list of wants too. 🙂 Took heed from Ms. Bowman-Jahn and bookmarked it! I feel like Lilly in Lilly's Purple Plastic Purse!!! Wow! That's just about all I can say, wow! My gracious!! The time and research it took for this absolutely, awesomely, amazing list. Ok, you've started something else this community is going to be expecting each year. You're a mindful resource, wrapped in comprehensive references, tied with a perfect bow of creative genius! WHAT A LIST, Lady! Thank you! Wow! and, Wow! I came back to your blog to check out something else, and found this amazing list. Mmm…. gonna print it off right this minute. You are so damn awesome lady. How do you do it? It's like dipping into the suprise chest every time I come here. Just never know what I might find. 🙂 Happy Thanks Giving to YOU! Wow, what an amazing and comprehensive guide, Susanna. Thank you for sharing! Thanks, Susanna! Would you use them to generate actual story ideas, or is it mostly a game to play in a group?